How does it interface with a video management system? HALO IoT Smart Sensor interfaces with a VMS in two possible ways. HALO can connect to a VMS via its event management system, thus allowing a direct correlation between the event time and the record time of a camera monitoring activities in/out of the room. HALO can also be connected to the VMS as a camera stream. The status of its sensors can be directly recorded as a video stream. Are you pursuing integration with any additional VMS platforms other than Milestone? Of course! Since HALO is a security device, we want it to work with any VMS. We started with Milestone since it is the largest VMS in the world. We are working with other large VMS providers to insure everyone will be able to end the vape epidemic in our schools and create safer work environments. How does a user get alerted to an event of aggressive/unruly behavior or vape detection? Is there any protection from vandalism? HALO is a SMART Sensor! As a security device, HALO is made of Vandal Proof plastic. We have not conducted tests yet on its IK rating, but we expect to achieve an IK8 rating at a minimum. HALO Smart Sensor also encompasses a tamper sensor in order to detect someone trying to damage it. If the tamper sensor is set, an alert can be sent out in the same manner as a vape alert, or, as an option, HALO has a speaker and light which can be enabled to blink or shriek to alert of the tampering. Who can install the HALO vape detectors? The HALO IoT Smart Sensor is very easy to install. It mounts in ceiling with a 5-inch circular opening and a single CAT5/6 cable with POE. We recommend you use an experienced security integrator to perform the installation to insure it is properly connected to your security system and is installed in the proper location. IPVideo has a network of Security Integrators throughout the USA and would be happy to recommend a certified installer. Read more about installing a HALO unit. Do we need a camera license to install these devices? HALO should not require a camera license in most cases if it is used only to send event messages to the VMS. If the end user wishes to record HALO’S MJPEG sensor screen, then a camera license would be required. Does the system have required updates? We are continuing to improve the performance and add new features to HALO. We recommend users keep HALO up to date with the latest firmware releases. The HALO device comes with a Utility Tool which allows updates to be pushed to one or more HALO devices. The end user will be notified when a new firmware version is available or can check on the IPVideo website. A cloud interface will be available in a future release which will allow the HALO to receive automatic download updates at specified intervals. This will require the HALO to have access to the internet. What can HALO actually detect? What do you need to detect? HALO has a host of sensors to perform multiple detections. 11 sensors to be exact. The combinations it detects expands it capabilities to be able to discriminate between different substances as well. For instance, HALO can distinguish between a person vaping and a person vaping with a substance laced with THC. It can tell the difference between vaping and hair spray, body spray and other airborne chemicals in most instances. How is the AI for the audio detection going? HALO has two audio sensors. It analyzes frequency responses and the decibel levels to identify gunshots. We have not yet tested the light sensor for triple verification to detect the gunshot muzzle flash however this is in future planning. HALO can typically cover 144 square feet with normal ceiling heights(8ft) for vape sensor however other sensors work effectively up to 1000 square feet. Its coverage area will also vary by the ventilation in the room, the ceiling height will also be a contributing factor. A pendant mount option is available to keep HALO at its recommend height of 8 feet. What is the ppm threshold that it would need to trigger the devices? The PPM thresholds are programmable and thus can be varied by room to match the conditions in that room. If vape is blown into a persons jacket, will HALO detect this? HALO was purposely designed to look similar to a smoke detector in order to mask its function as a vape detection tool. HALO is an effective tool to detect vape but will have obvious limitations if a person uses some physical methods to obscure their vaping. Filtering through clothing, opening of windows, etc. can lower the levels of chemicals reaching its sensors. They are currently available and we have new production runs every 6 weeks. Is there a minimum quantity to purchase? No, however there are volume discounts for purchases of 10 or more. Is the HALO IOT Smart Sensor available through distribution or direct from IPVideo? Currently direct from IPVideo only, however distribution relationships are being worked on. Are there any re-occurring connection charges? HALO can be viewed from any SMART device or computer. It does not utilize the cloud for any of its detection capabilities for privacy reasons. Since the unit is self-contained there are no re-occurring connection charges. We do recommend connecting HALO, since it is a security device, to your security system. You may of course chose to use an outside service to monitor its alarms and events. What is the process for getting a demo unit? You can purchase a unit directly from IPVideo. Are these recommended for school bathrooms? 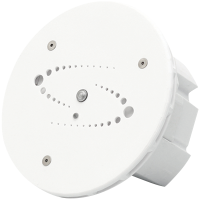 HALO IOT Smart Sensor is a security device which is designed to maintain privacy. Bathrooms and locker rooms are two such places we intended HALO to be installed. Are these currently being used by any schools in the country, and if so, what successes have they reported? HALO is currently in use in schools throughout the US and they have uncovered many instances of both vaping and THC use. Would HALO work in college settings? Yes, HALO is suitable for use in Colleges and Universities, Hospitality Centers, Commercial buildings, Malls, etc. Any location where VAPING needs to be controlled and there is a security system or security service to monitor its ALERTS/EVENTS. It is perfect for dorm rooms if colleges are concerned about students smoking various substances in rooms. How can the system be use in industrial complexes? HALO is a SMART sensor with the ability to expand its capabilities in the future. HALO is suitable for use in any industrial complex where vaping or chemicals need to be controlled and there is a security system or security service to monitor its alerts/events. HALO also detects chemicals such as CO2, CO and NH4 – its capabilities will depend on the type of chemicals which are required to be be detected. What is the lifespan of the sensor? We expect the lifespan to be 3+ years, similar to standard smoke detectors. Does HALO have any warranties? HALO comes with a 1 year warranty. Multi-year extended warranties are sold separately. Have a question we didn't answer? Let us know!